A couple of weeks ago, I had the real pleasure of being a judge at the World Bread Awards. Judging took place at Westminster Cathedral no less. There were 15 different categories and I was assigned to the flatbread one. I would have loved to be on the sourdough team of judges, but I learnt an awful lot about focaccia and the qualities that make a good flatbread. The awards will be announced on 11 October. My recent Suma order not only included a large bag of organic spelt flour, but also some golden wholemeal flour. I thought I might use that to make focaccia. 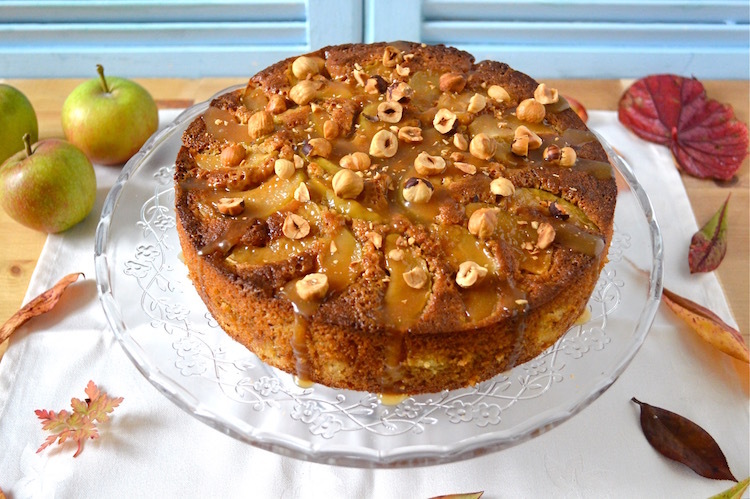 I’ve already requisitioned some of it to make a fabulous toffee apple hazelnut cake. I’ll be posting about that at some future date – see the picture below. Hazelnuts were part of the order and as you can see have been heavily used already. I’m particularly excited by the British fava bean and pea flours from Hodmedods, I nearly included some in this bread, but in the end I thought they’d be better used in their own right. I also have baking plans for the semolina, pumpkin seeds and pistachios. 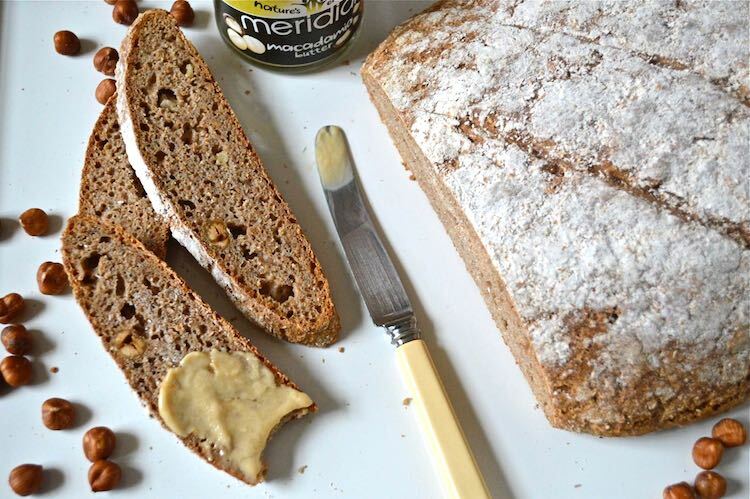 As for the macadamia nut butter, that is so good, I don’t want to use it for anything other than spreading it on bread – this spelt rye sourdough bread. I’ve just realised that in all my years of making rye sourdough, which I started after attending an excellent bread making course at Schumacher Collage with Andrew Whitley back in 2009, I’ve never posted a sourdough recipe. I’m quite shocked. Normally I make a straightforward rye sourdough, but occasionally I branch out and make something a bit different. This apple hazelnut spelt rye sourdough bread loaf is one such occasion. Neither rye nor spelt flours need a lot of kneading, which is all to the good. In fact they both make great no-knead breads. The addition of both ground and whole roasted hazelnuts turned out to be an inspired decision. They combined beautifully with the tart apple and a little scented cinnamon brought out the inherent sweetness of the spelt flour. The house smelt just wonderful whilst the bread was baking and for a long time after too. The result was all that I could hope for. The bread is soft with a chewy crust and tastes totally delicious. It’s great spread simply with butter, but also works well with the macadamia nut butter. I have yet to try it with cheese, but I’m certain that will be good too. 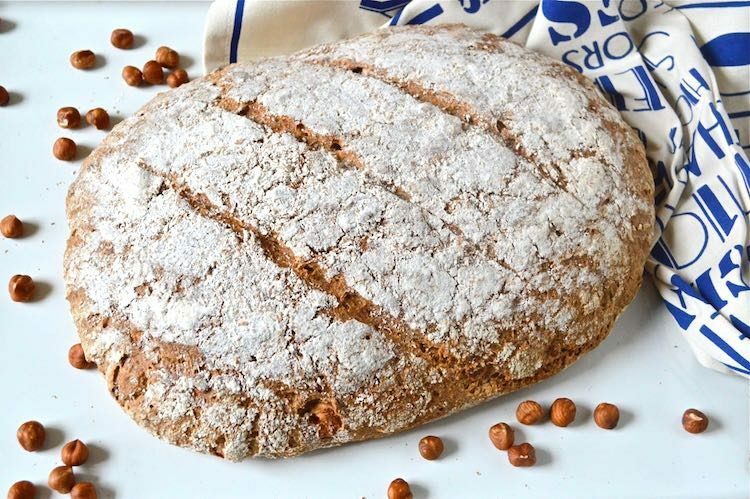 Made with roasted hazelnuts, tart apples and spicy cinnamon, this savoury recipe for an apple hazelnut spelt rye sourdough bread loaf is awesome. The night before baking the bread, mix the rye flour with 450ml of warm water in a large bowl. Add the sourdough starter and stir well. Cover loosely with a plastic bag and leave to ferment overnight. In the morning remove 75g of the ferment into a covered glass jar and place in the fridge until the next time a sourdough starter is needed. To the remaining ferment, add the spelt flour and knead in a stand mixer for a couple of minutes. The mixture is quite wet, so it could be difficult to do by hand. Add the remaining ingredients and knead for a further 5 minutes or so. Form into a freestyle loaf and place on a greased or lined baking tray. As the dough is quite a soft one, a free style loaf will flatten out. For a uniform loaf, place the dough into a 1 kg/2lb loaf tin. Cover loosely with a plastic bag, ensuring it doesn't touch the dough and leave to prove until the loaf has risen by about ⅓. This could be anything from 2 to 6 hours depending on the temperature of the room and the liveliness of the starter. Dust with a little spelt flour and slash the top 2-4 times with a sharp knife. Bake at 200℃ for 40-45 minutes or until the bread sounds hollow when the base is tapped. allow a further 10 minutes or so if baking in a tin. Overnight ferment and a few hours proving time is required. 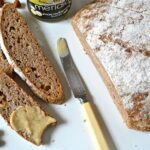 This apple & hazelnut spelt rye sourdough bread loaf is my sixth recipe for the Suma Blogger’s Network. I’m also sending this off to Katie at Feeding Boys for this month’s Simple and in Season. If you make this apple and hazelnut spelt rye sourdough loaf, I’d love to hear about it in the comments below or via social media. A photo is always good too. For more delicious and nutritious recipes, follow me on Twitter, Facebook, Instagram or Pinterest. What a wonderful and delicious looking loaf of bread. I bet it tasted great too. Yes, this is definitely my kind of bread. Why don’t you bake it any more Angie? I just love how you have included apples and hazelnuts in your sourdough loaf, such an amazing combination of ingredients and the epitome of autumn! Thanks, Choclette, for including my bread here :-)) Well, I have been trying to cut down the carbs. and whenever I made a sourdough or any bread with levain, I just couldn’t resist, esp. the thick chewy crust…I still use sourdough starter, but mostly just for the added flavour. You are so good Angie. I’d find it very hard to give up bread. Nice idea to add the starter to other bakes. I ought to try that. Thank you. I’ve never made sourdough, I must remedy that one day soon once I get a,starter from somewhere. Love those autumnal flavours, I bet it made the house smell amazing as it baked! The house smelt wonderful while the bread was baking and for ages after too – win win 🙂 Can you bake bread in a slow cooker? It sort of seems counter intuitive as you generally need a hot oven. It would be really interesting to see how a sourdough loaf turned out though. It looks fab. I love baking bread, but I didn’t bake sourdough. I want to get the starter and start baking. Your recipe sounds delicious and I’ll remember it. Thank you Anca. If you like baking bread, it’s only a matter of time before you’ll feel compelled to try sourdough. I have never baked bread before. Would love to try this recipe. Sounds very yummy. If you’ve never baked bread before, it might be better to start with a normal yeasted bread rather than a sourdough, but it’s really not that complicated. that looks like one phenomenal bread. I love the idea of apple and hazelnut… I bet this was amazing toasted. Love the sourdough recipe! I love homemade bread and rye bread is particularly good. Pass me a slice won’t you? Ooh now, GF sourdough would be interesting Kate. I’m a bit of a stick in the mud when it comes to bread making and generally make the same old sourdough, but occasionally I feel the need to branch out. I think I’ve got the bread matters book by Andrew Whitley somewhere, will have to dig it out, he really knows his stuff! This loaf sounds yummy, I love the seasonal ingredients, you have to be on top form to beat those squirrels to the cobnuts! Thanks Amy. Andrew is an amazing baker and his book is fascinating. It’s not the squirrels that get our nuts, it’s the birds. We didn’t get a single one this year. How cool that you were a judge at the World Bread Awards!! I’m useless at bread but this sounds sound really tasty. It was really cool Becca, although I felt pretty inadequate as a bread maker after seeing so many fantastic loaves. Thank you. I just finished the last of it yesterday and I’m regretting it already.